“What is fear? It is only a thought. If (only) there is anything besides the Self, there is reason to fear”. 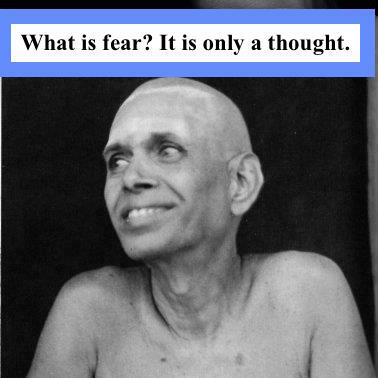 Sri Ramana in Talk 146 (Talks with Sri Ramana Maharshi). Highlighting the role of ego as an impediment on the spiritual path, Sri Ramana concludes, “All bad qualities center around the ego. When the ego is gone Realisation results by itself”. Sri Ramana’s teaching is that all fear and suffering is ego based. Because the ego views itself as separate from God (the Universal Intelligence), all its energy goes towards maintaining its existence, its identity. The ego based attachments essentially constitute our individual personality. The more intense our attachments to people and things, the more intense our suffering will be. The natural peace and happiness inherent in the Self dominates when ego identification with actions and thoughts disappears. Sri Krishna tells Arjuna in the Bhagavad Gita that although the mind is difficult to control, with repeated practice, it gradually subsides. Outlining the path of Karma Yoga to purify the mind, Sri Krishna advises Arjuna to take action but to not be attached to the fruits of the action. In this way also, identification with the ego thins out and one attains Realization of one’s true nature. Sri Krishna says to Arjuna, “Therefore, always perform your duty efficiently and without attachment to the results, because by doing work without attachment one attains the Supreme. (BG 3.19). Sri Ramana used to say that spiritual practice should be carried out until the Self becomes spontaneously and effortlessly self-evident in all states of consciousness as being the natural state.